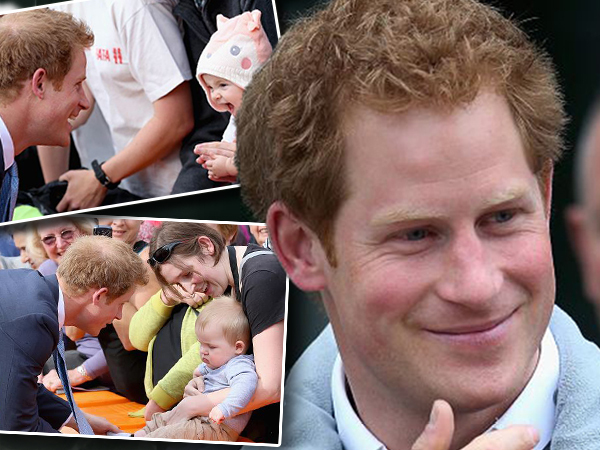 Britain's Prince Harry wishes he could have children now. The 30-year-old royal is already an uncle to his brother William's two children 21-month-old Prince George and newborn Princess Charlotte. Harry is currently completing a tour of New Zealand as part of his attachment to the Australian Defence Force, and being away from home has made him think about having a family. "There come times when you think now is the time to settle down, or now is not, whatever way it is but I don’t think you can force these things, it will happen when it’s going to happen," he told Sky News royal correspondent Rhiannon Mills. "Of course I would love to have kids right now but there’s a process that one has to go through and tours like this are great fun, hopefully I’m doing all right by myself, it would be great to have someone else next to me to share the pressure, but you know, time will come and whatever happens, happens." Princess Charlotte was born on May 2, when Harry was already in New Zealand. It means he hasn't met the new arrival yet, although William and his wife Catherine have been keeping him updated on her. "She was a little bit late, hence I missed her, so she’ll have to work on that, but apart from that it’s fantastic news for both of them so I’m thrilled," he laughed, adding that William has been sending him pictures of the baby to keep him in the loop. Harry's current tour is a large one and he's aiming to see as much of the country as he can. He's enjoying it immensely, but explained he also needs to work for his wellbeing. It's something he and William, who is an Air Ambulance pilot, agree on. "Both of us feel as though we need to have a wage as well to work within normal people, to keep us sane, to keep us ticking along and also surely in the future from our point of view, if we want to make a big contribution, or a valid contribution and be taken seriously, then we need to work alongside other people," he explained. It's not all been questions from the professionals, Harry has also faced inquiries from fans while abroad. Children from Halfmoon Bay school on Stewart Island asked him all about his life as a royal, with one keen to know if he calls his grandmother, Britain's Queen Elizabeth II 'nan'. Harry replied that he goes for 'granny' instead. Another tot wanted to know why his granddad, Prince Philip, isn't known as king even though he's married to the queen, while Harry also fielded questions about whether he lived in a castle. "Sadly I don’t live in a castle and I don’t even own a crown either," he laughed.